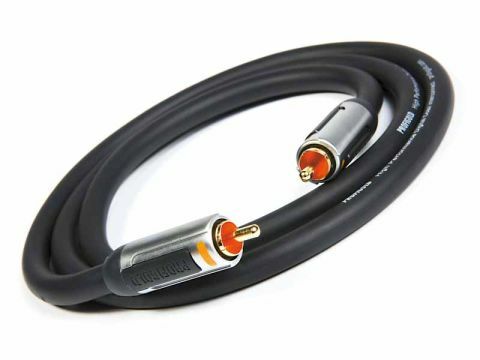 The Profigold PROA4801 is a cable specifically targeted at digital signal transmission (it'll serve just as well for video as the requirements are the same), whose most striking characteristic in present company is its welcome flexibility, despite the 8mm diameter. According to Bandridge, construction uses OFC copper conductors, with tape and braid screening and some pretty robust connectors fitted. Longer lengths, up to five metres, are available, in which case the model number changes – PROA4802 is two metres, and so on. Cheap it may be, but this cable seems to need little or no special pleading. We tried it between various combinations of source and DAC, and achieved results varying from decent to very good. One of the ironies of digital signal transmission is that the fragility of the signal depends on the receiving equipment, so the very best DACs, which have good jitter and interference rejection, are less fussy about cabling. As a result this cable did very well with the dCS DAC. It's also entirely satisfactory feeding any digital recording device. With cheaper DACs there seemed to be just a shade of grain and coarseness in the sound at times, and tonality is a little lumpy in the upper bass; otherwise, the Profigold PROA4801 is an impressively capable budget cable.